Though we are still unsure of what causes Autism or how to cure Autism we do know that through early diagnosis and intervention children with Autism improve. Symptoms are reduced creating healthier, happier lives for parents and children. An intervention program is critical in assisting these children to achieve their full potential. The Early Steps Program of Broward County serves children with delays in physical, cognitive, communication, social, emotional or adaptive development, or who have a diagnosed condition that has a high probability of resulting in a developmental delay. This comprehensive program, which is supported by state and federal funds, provides multidisciplinary evaluations and interventions to infants and toddlers who are a high risk for, or who are identified as having, developmental disabilities or handicapping conditions. 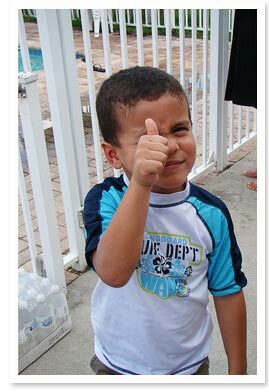 The Early Steps program provides multidisciplinary developmental evaluations, service coordination, intervention services and other family-centered resources to any Broward County child, birth to three years of age, who may be at risk for disabilities or have a significant developmental delay. Most of these services, are free of charge or covered by insurance or Medicaid as applicable. Early Steps services are based on Early Steps evaluations and each family's concerns, resources, and goals. The staff of Children’s Diagnostic and Treatment Center understands the valuable resources and the positive benefits that the Early Steps Program offers families with special needs children. It brings services into the child's life rather than fitting the child into services. Children are able to maximize everyday day natural learning opportunities for academic growth. Early Steps is an outlet that enhances each child's development and participation in community life. The program not only helps each child to achieve their full potential but it also gives families the encouragement to keep moving forward. Each child is unique and will progress in their own time; it is the opportunity for growth and change that Early Steps provides through knowledge and a great love for children. For more information about Children’s Diagnostic & Treatment Services Center and the Early Steps Program, view our additional articles or visit the Children’s Diagnostic & Treatment Center website.